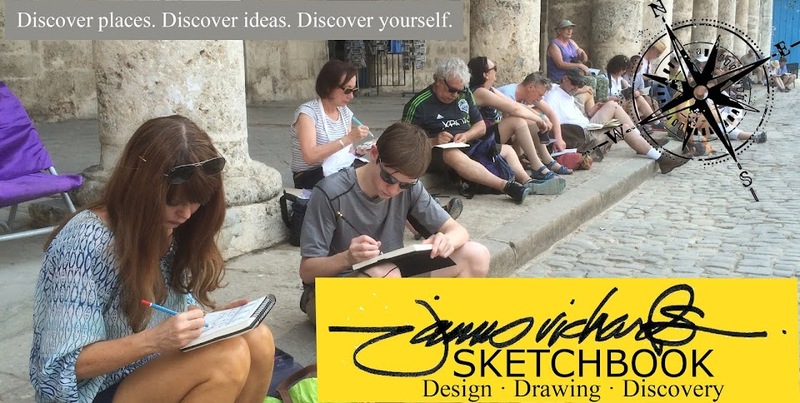 More from Santo Domingo...the second exercise of the "Improvising Lines and Colors workshop with Inma and Orling afforded us a chance to look further afield for subjects, though by late morning the heat was already oppressive. 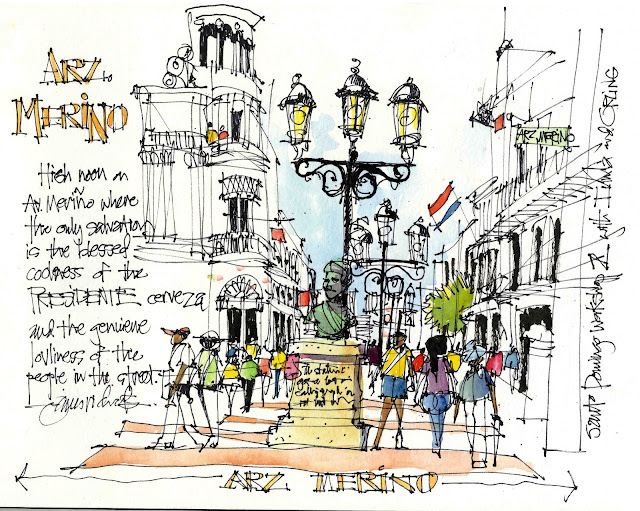 I employed my cunning urban sketching skills to find a lively street scene that I could capture while enjoying an ice cold Presidente cerveza at a shady sidewalk table (one has to stay hydrated while working outdoors). When Inma and Orling found me drawing from a table littered with pens, watercolors and beer bottles, Inma said, "You...you understand LIFE!" That's a critique i will always treasure. Yes, Jim sure. It was a really good way to understand our exercise proposal. Drinking a cold beer life is much clearer and your hand and head connect instantly. I noticed that I spoke English fluently, almost from Oxford, after drinking two or three Presidentes. Your work in our workshop was amazing. Thanks again. Thanks Inma; you're a great teacher and friend. fantastic critique Inma!, and a fantastic sketch James. When I took my first sip of Presidente I understood LIFE a little more and the blessed coolness that you wrote of, and I definitely understood the genuine loveliness of the people in the streets that you have captured so well in your drawing. Great post! Thanks Scott! Yes, I guess i should have added a Presidente label to the page to enhance the storytelling.